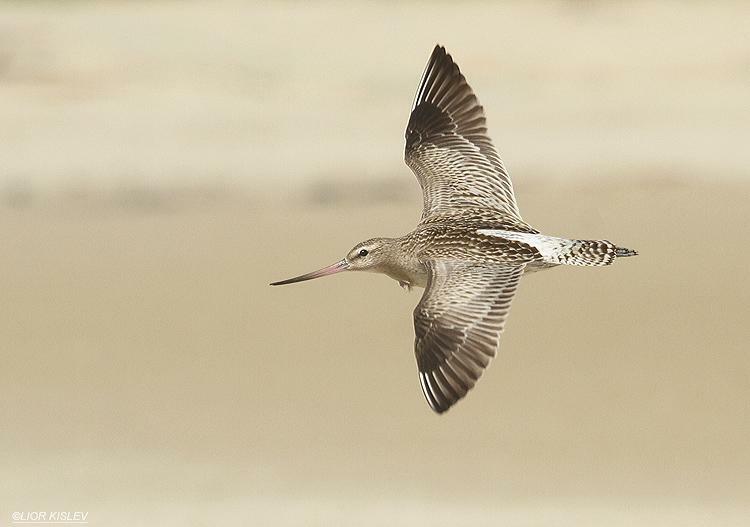 During fall migration, a Bar-tailed Godwit like this one will fly over the Pacific Ocean, making a non-stop flight of 7,000 miles from Alaska to New Zealand. These amazing birds can achieve their epic journeys only after fattening up – along the coast of Alaska in fall, or along the Yellow Sea during spring. However, the food-rich tidal mudflats of the Yellow Sea are disappearing rapidly. Using satellite tags, Nils Warnock of Audubon Alaska studies the godwits’ migration routes – and notes the critical importance of the Yellow Sea. “These godwits are epic migrants. We had a bird, E-7, that we had tagged, and she left New Zealand in the spring. She flies non-stop seven days, ten thousand kilometers, to the Yellow Sea. All of the Bar-tailed Godwits of Alaska, they stop at the Yellow Sea. However, the food-rich tidal mudflats of the Yellow Sea are disappearing rapidly. So that really struck…home…the critical importance of the Yellow Sea. That’s their only stopover site between New Zealand and Alaska is the Yellow Sea. There’s a lot more to this story at BirdNote.org. I’m Michael Stein. Bird sounds provided by The Macaulay Library of Natural Sounds at the Cornell Lab of Ornithology, Ithaca, New York. Calls of Bar-tailed Godwits  recorded by G. Vyn. Show opens with calls of Bar-tailed Godwits on xeno.canto  recordist unknown. www.iucn.org/dbtw-wpd/edocs/SSC-OP-047.pdf The IUCN Situation Analysis on Intertidal Habitats in the East Asian-Australasian Flyway, Yellow Sea.